In October 1987, the Esprit sports car received its first revamp since its initial launch in 1976, and was given the project codename X180. This design was the work of Peter Stevens, who was also responsible for the styling of the Lotus Elan M100 and McLaren F1. Whilst it retained the basic creativity behind the original Giogetto Giugiaro design, it featured rounder, and smoother lines, which helped to produce a drag coefficient of only 0.33. It was, in essence, a restyled bodyshell on an established, proven chassis, and displayed "Turbo" badges behind the line where the door shut. At the rear, there was an aerodynamically profiled under tray/spoiler to remove heated air from the engine compartment, and cool the brakes. Mechanically, the X180 differed little from its predecessor, the Esprit Turbo HC, with its 2174 cc, 16 valve, double overhead cam, Lotus 910 engine, developing the same 215 bhp, and 220 ft/lbs of torque. An important change was in the gearbox, in which the Citroen/Maserati five speed unit was replaced by that from the Renault Alpine GTA saloon, and provided slightly higher gear ratios. Other improvements, following a redesign of the interior, included increased headroom and legroom, and a wider foot well. With the higher gearing and low drag, it was slightly faster than the HC variant. Producing a 0-60 mph time of 5.4 secs, and a 0-100 mph time of 13.3 secs, it was actually faster than a Ferrari 328GTB and Porsche 911 Carrera 3.2. The X180 was a financial success, with 1,058 Esprit's being built in 1988, a figure that would never be repeated. The glassfibre body was now produced using a new Lotus process called Vacuum Assisted Resin Injection (VARI), which offered additional advantages over the previous system. For improved roll over protection, the roof and sides were reinforced with Kevlar, which resulted in a 22% increase in the body's tortional rigidity. In late 1988, the Esprit Turbo HCPI high compression variant was replaced by the X180 Turbo MPFI sports car, which was fitted with the GM/Delco Multi Port Electronic Fuel Injection, in place of the previous Bosch K-Jetronic system, and developed 228 bhp. The benefit to Lotus was that the Delco MPFI system delivered more power (228 bhp compared with 215 bhp) and more torque (218 ft/lbs at 4000 rpm compared with 192 ft/lbs at 5000 rpm) than was available from the Bosch system. In mid 1989, an additional variant was introduced, fitted with the Delco MPFI system, together with an intercooler, which Lotus renamed a charge-cooler. This was designated the Esprit Turbo SE sports car, and this special equipment model was powered by the Lotus 910S engine, which developed 264 bhp. Furthermore, it was fitted with a temporary over-boost facility, in which output could be increased to 280 bhp at 6500 rpm, for a period of up to 30 seconds, when undergoing hard acceleration. The result was that the 0-60 mph time was reduced to 4.7 secs, with a top speed of 159 mph, which was on a par with the Porsche 911 Turbo of the period. Air conditioning and a glass sunroof, that could be both tilted and removed, was standard equipment. In Autumn 1990, the Esprit Turbo S sports car was launched into the UK market only, with an MPFI engine developing 228 bhp, but with a limited number of accessories. The original X180 Turbo was discontinued in 1990, with the Turbo S following it a year later. In December 1991, an unusual variant, aimed at the Italian market, was powered by a new 1994 cc, 900 Series, 4-cylinder engine, fitted to an intercooler, turbocharger, and with SE trim, and developing 243 bhp at 6250 rpm. In late 1996, this engine was featured in other markets. In order to compete in the American Supercar Championship, Lotus produced the X180R, based on the SE variant, developing 300 bhp, and with racing features. The European version of the X180R was the Sports 300 sports car which was, in fact, the best performing 4-cylinder Esprit Turbo. Between 1990 and 1991, sales of the Lotus Esprit increased three fold. 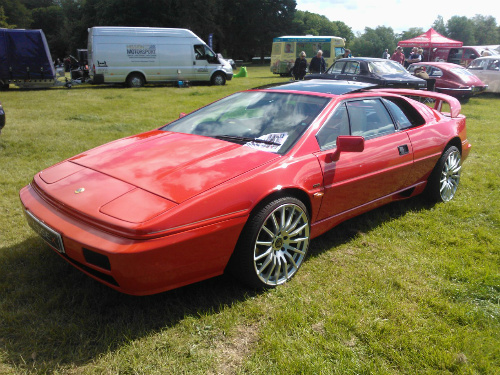 A 1988 Lotus Esprit Turbo X180 in good condition would fetch in the region of £14,000/$22,000.